Shaleena and Zina Campbell, both majoring in business administration in Oswego's School of Business, last year started Harlem Dress Collective, whose progress impressed Harlem Fashion Week organizers so much they named the identical twins "Cultural Fashion Groundbreakers" at a gala and ceremony on Feb. 16. "The event was amazing," Shaleena Campbell said. "It was unimaginable to be recognized alongside pioneers of black fashion such as Jeffrey Banks, Constance White and the Harlem Haberdashery family. The feeling of unity was immense as many people in the room pledged to help our goal of combating the cost of prom in Harlem." The Harlem Dress Collective started humbly, but the sisters now anticipate they may need two distribution days to make sure the dresses go to as many deserving girls as possible in time for prom season. "Without Harlem Fashion Week, we wouldn't have a lot of resources for our Harlem Dress Collective," said Zina Campbell. "Once they posted us (as award recipients), we started to blow up inside of Harlem! Companies that wouldn't respond to us before started saying, 'Hey, let's help.' Many people and businesses have helped." The dresses -- including those that surfaced during closet cleaning at home last August -- are stored at their mother's house. Shaleena and Zina came up with their charitable business model: "We are starting, like, a library, where girls will take a dress, wear it, get it cleaned and put it back in our stock. It’s a revolving thing," Zina said. Their mother helped with the collective's website. The Campbell sisters, both of whom have their sights set on careers as entrepreneurs, were stunned when they received a call about the Harlem Fashion Week award not long after an initial meeting with organizers. "We talked to people (from the fashion celebration), and they wanted to know about the dress collection and things," Zina said. "Two weeks later, they said, 'We would like to nominate you for the Cultural Fashion Groundbreakers Award.' It was weird, like, all we do is collect dresses. We were so focused on one thing, but through that thing, we got something else. Harlem Fashion Week’s whole thing is 'Fashion with a message,' so it was more than just the dresses." Shaleena added, "It’s being able to uplift the community through the dresses. Why miss out on an experience because you can’t afford a dress?" The Harlem Dress Collective strives to create a positive environment for high school girls where they can try on and pick out prom dresses "they truly feel comfortable in and love, not because someone told them to, but because they know/feel they look good," she said. As of mid-February, the Harlem Dress Collective had about 80 prom dresses, many from individuals, but some brand new ones from retailers David's Bridal and Faviana Couture. The founders hope to reach 100 dresses before the initial distribution day April 27 at Harlem's National Black Theatre. Meanwhile, the Neighborhood Thrift Collective has agreed to serve as a drop-off point for donations, Zina said. Help has arrived from many other individuals and businesses around Harlem. "The Sugar Hill Creamery, a family-owned ice cream shop in Harlem, allowed us to have our very first event there, an ice cream social where we collected dresses. That was very nice," Shaleena said. The Campbell sisters also credited Sarah Bonzo of SUNY Oswego's business faculty for her guidance, graphic arts student Mercedes Buhner for the collective's logo and other individuals on campus for their donations and social media posts. Their latest effort is to obtain 501(c)3 status for the Harlem Dress Collective. "Sarah Bonzo has been a tremendous help, guiding me through a lot of the processes, helping me with contracts, keeping me on deadlines, pushing me out of my comfort zone to talk with companies," Shaleena said. What happens if too many girls show up on distribution day for the prom dresses? "To prevent that, we're reaching out to guidance counselors at high schools all around Harlem, searching for about 30 girls to sign up for the event," said Zina. "It’s going to be a closed event for those girls. They’ll try dresses on, put some makeup on, take photos. We need a lot of dresses so they get one with the right fit." Shaleena added, "That will leave us with more dresses. We may try to hold another event after that one; we haven’t really thought about that yet -- maybe a first-come, first-served type thing." The sisters are still astounded with their newfound fame. "Starting the Harlem Dress Collective as two African American college students with little resources has felt overwhelming at times, but that (awards) night the message sent to us was that we weren't alone and starting at the bottom with this," Shaleena Campbell said. "We have people like (Coty Award-winning designer) Jeffrey Banks and (award-winning journalist and arbiter of culture and style) Constance White who are there to guide us as we follow in their footsteps." For more information on their project, visit https://www.theharlemdresscollective.org. For more information on SUNY Oswego's School of Business, visit oswego.edu/business, call 315-312-2272 or email business@oswego.edu. 'Cultural Groundbreakers' -- Harlem Fashion Week co-founder Tandra Birkett (center) presents SUNY Oswego senior business administration majors Zina (left) and Shaleena Campbell with the "Cultural Fashion Groundbreakers" award for their non-for-profit business, the Harlem Dress Collective, to help girls to better afford to attend their proms and look good doing it. 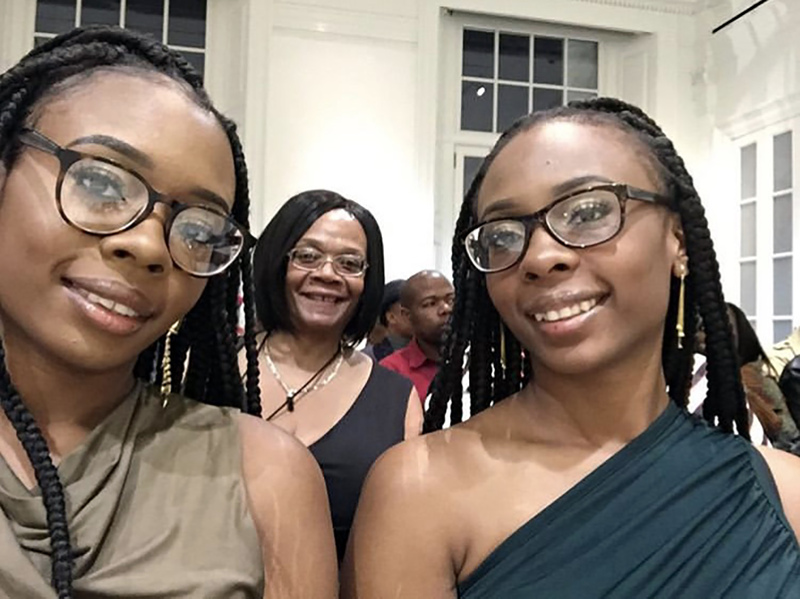 Honor for twins -- SUNY Oswego senior business administration majors Zina (left) and Shaleena Campbell add their mother -- who assisted with their Harlem Dress Collective's website -- to a selfie at the Harlem Fashion Week gala, where the twin sisters won the "Cultural Fashion Groundbreakers" award.